It is difficult to decide were to start with Naruto as their are two in my option very different entities which broadcast Naruto. These are the Manga and the Anime. Were as the Anime supposedly follows the Manga, the Anime writers often deviate from this path and insert the dreaded spoilers. Now some spoilers are good but face facts the Anime writers are no where near as good at writing a storyline like Masashi Kishimoto (creator of Naruto). The reason for the Anime people to insert spoilers is to stop them from catching up with the Manga and not being able to produce episodes on a weekly basis. they would catch up because when the Anime follows the Manga they usually do more than one chapter in one episode (depending on the chapter) leading to them slowly catching up. The background of Naruto is like many other Manga and Anime. He starts of as a young boy who is full of spirit pretty stupid but good fun to watch. he then grows up learning new skills and defeating new enemies always with the thought of his friends in his head. Naruto holds his friends very highly and would die to protect any of them. this train of thought arises from him having no family and being feared by everyone due to him being a Jinjuriki (holder of a tailed beast) this makes him very lonely and therefore when he gains friends (which he is pretty good at doing) he holds on to them. The music in Naruto was good for the first 100 episodes and yes they do change the theme song every 10 or so episodes. however the reason it falls down 2 places for me is that the music in the Anime is VERY repetitive. After the first 100 episodes they have pretty much used the same music for each scene which is pretty boring. Also the theme songs are sometimes so dull you have to wait for the Anime to load instead of listing to that garbage. The characters in Naruto are very good in fact it boasts one of the widest range of characters than any other Manga/Anime I have seen. the only reason it drops 1 star for me is it is to centralised on around 6 of the main characters, in my opinion the Anime/Manga need to bring a larger range of variety into the episodes bringing in a wider range of characters. the only time they actually do this surprisingly is in the spoilers! Now here is were Naruto scores full marks for me the animation team at TvTokya do a create job animating terrific fight in stunning detail 720p is amazing! (not trying to persuade you to become Anime members ) 5 stars go to the animation of Naruto Shippuden and I hope they can keep up the stunning job they are doing! Overall then, taking all into account I gave Naruto shippuden 4/5 stars. Though they lack a bit on the music front the storyline is amazing (if they removed or improved the spoilers it would be better) the characters are great and the animation is first class. if i was to recomment an anime to someone naruto without spoliers would be the one without question! Naruto Shippuden is a must see anime. I can't even think of what life would be like for me without it. Starting of from where the first season ended, Naruto Shippuden is a fun action packed, and most of all; an easy to fall in love with anime. It includes all of our favorite characters, even the snake himself Orochimaru. However Orochimaru isn't the only one naruto will have to face off with, The mysterious Akatsuki, returns and this time meaning business......... The thing about Naruto Shippuden, is that it only gets more exciting!!!! I hope you enjoy this anime as much as I have! i even buy many stuff about naruto. the head protector things && etc. it entertains me a lot. the way of them of being ninjas is cool! they have the fighting spirit especially naruto. The storyline is very interesting for all anime fan's. It's not like other anime,it about a ninja world that's make this anime storyline better. The Characters are drawn well so the character look goods. How Many Naruto Fan Reviews Are Needed? The very idea that this is worth 5/5 across the board is ridiculous, I've loved this series for God knows how long now I still wouldn't be ignorant enough to think that. I know this is a bad way to start a review that is basically going to say that I do in fact think Naruto is amazing but it is something that needs to be said. Especially as a lot of people will justify it by the fact that its going so long which does give it some advantages it also helps to prove my point, the examples I gave achieved greater in a shorter amount of time, the Storyline of Eureka 7 is simply amazing and it resolves itself in 51 episodes, it does not speed the story up nor slow it down. Akira in literally an hour and a half gives us characters with such rich depth. But I digress the point is yes Naruto is very good but just stop with the ridiculous reviews. The openings and endings they use are always really good I think that its one of the reasons I watch, I own most of the singles because they are just so good. Well yes mr "random reader" but Naruto always brings out winners I think theres only been like 2 or 3 songs that i didn't enjoy from the beginning of Naruto. The music itself is also very well done both "Takanashi Yasuharu" & "Toshiro Masuda" are genius' at capturing the world of Naruto in their music and then tweaking it for the right occasions. That pretty much sums it up I don't there is any need to evaluate the characters because the number is so expansive that i'd rather give a basic a vague overview instead so to say that because of the length given to the anime the major characters are given loads of depth, which unlike Bleach does actually grow and you get to know slowly more about everyone. I tried watching Naruto wen thats all my friends would talk about a few years back, but as I watched the first episode, i just stopped midway because....well....the truth was...THE ANIMATION WAS THE WORST I'D EVER SEEN! About 2 years l8r tho one of my friends convinced me 2 watch the entire thing through, and needless 2 say, I was impressed. ^^ The animation improved greatly, although it could still use some work (especially during the fillers....) but I still luv the show itself and all it represents: a strong friendship (which really touched me during the sasuke retrieval arc). Honestly, (and most people would hate me 4 this) I never watched the sub version of this show (except 4 some snippets of shippuuden since there has been some of my fave couple moments in it). I really think the naruto voice actors 4 the dub are quite brilliant (especially Naruto's). Hound me all u want, u wil never get me 2 watch a subbed show if the dub seems GOOD 2 me. ^^"
Anyway, what can I say? 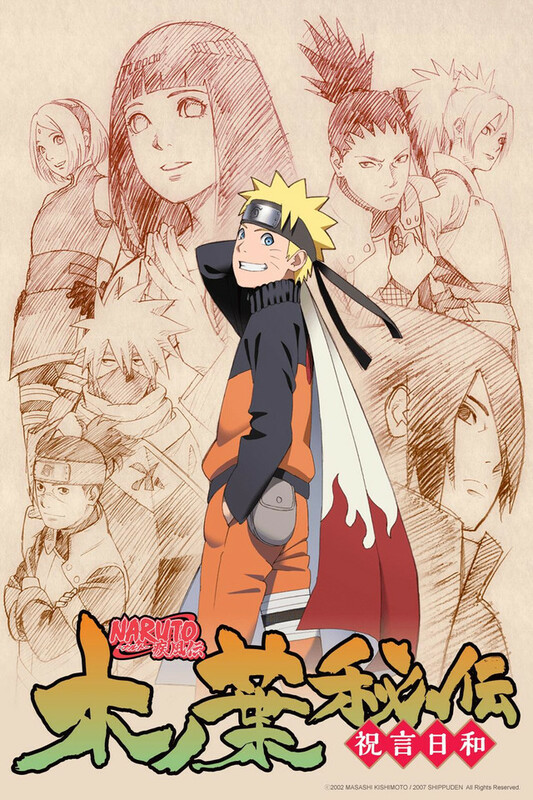 The Storyline's good, the music....eh, average, the characters u can really relate and understand, and the animation is.....well it could use sum work, but is average (but I luv the way kishimoto created Naruto....^^). thx 4 ur time! I luv wasting it! Storyline: First of all i read the manga more so then watch the show. i wont post any spoilers, but the deal with naruto shippuden that annoys me is that they still put in useless fillers even though the manga is plenty far enough ahead. other than that, the fact that they focus more on Akatsuki rather than Orochimaru is a good thing because Orochimaru isn't all that interesting. 3/5. Music: I honestly do not care about the opening and ending songs as they do not directly affect the show in the slightest. But the naruto shippuden background music is what's most important and as far as i see it, they failed. In the first series of naruto the background music would get intense during fight scenes and Dramatic during times of peril, death etc... In naruto shippuden they changed the background music entirely and the intensity of the music is far less then it was in the first season. Tbh i think it would have been better if they stuck with the original music from the first series. 2/5. Characters: This is probably the only good aspect of the show, Some of the characters in Naruto are rather interesting, the only problem is that the interesting characters don't get enough air time. 4/5 - (lenient was thinking more of a 3.5). Overall: the show is watchable to normal person. but if you are a "Naruto Freak" then you will probably claim ignorance to any flaws the show has and fall in love with it instantly and just give it straight "5's". Overall its not the worst but nor is it even close to being the best. i give it a 3/5. Yes we all know Naruto is old. 10 years maybe? No exactly 10 years. Its quite the anime/manga. With the get back your best friend type storyline. Twisting into the menacing evils and the cloaks with red clouds. Your father saved you to be killed in the process. You grow up friend/familyless and end up becoming the hero of the said town that hated your guts. This is what keeps Naruto Fans coming back.